BRUCH & BRUCH CONSTRUCTION, INC.
- Bruch and Bruch’s crew will perform the work professionally and with the intent of providing a finished project that Bruch and Bruch and the owner can be proud to have been associated with. - All of our staff here at this office that has communicated with Bruch and Bruch staff over the years consistently found them very personable, professional, and efficient. - Bruch and Bruch shows by action that the safety of their crew and all associated with the project is an important aspect of their organization. I have been employed by Clallam County for nearly 25 years. During that period of time, Clallam County has awarded many construction projects to Bruch & Bruch, Inc. Their field operational procedures are excellent. They seek opportunities for cost savings and are willing to bring them to the table for consideration by both the County and Bruch & Bruch. When Clallam County is fortunate enough to award a contract to Bruch & Bruch, Inc., whether it is a County funded project, or whether it is a project that is federally funded, we are confident that the end result will be a correctly executed project, received on time, on budget, and with all the appropriate documentation in a timely manner. Federal Highway Administration: Camp Grisdale Road- Best Large Project Customer Satisfaction 2010. Federal Highway Administration: Sol Duc Repairs & Sol Duc Valley Road. Best Small Projects for 2006 & Best Project voted by the FHWA Construction Employees. Washington State Department of Transportation: SR 112 Jim Creek Culvert Replacement. 2005 Partnership for Excellence in Contract Administration (Western Washington projects Less than $2,000,000). Washington State Department of Transportation: SR101 Nolan Creek Vic Bridge and Realignment. Nominated for Partnership for Excellence in Contract Administration. Washington State Department of Trasnportation: SR 101 MP 321 & MP 322 Vic Slides. Nomintated for Partnership for Excellence in Contract Administration. Clallam County Public Works: Old Olympic Highway, Gasman Road to Lewis Road (Sieberts Creek Bridge Replacement). 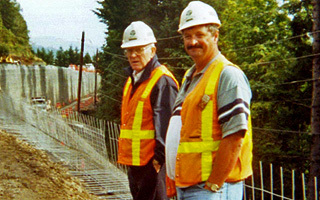 1999 Wsdot’s best County project award for excellence. Copyright 2007-2014 Bruch and Bruch Construction, Inc. All rights reserved.